It has been a while since my last post as I have been busy with a project at work as well as planning for my self-drive holiday in NZ. I will be leaving tonight and therefore I thought I will do a quick post on a simple card that I have made and is on its way to Melbourne. 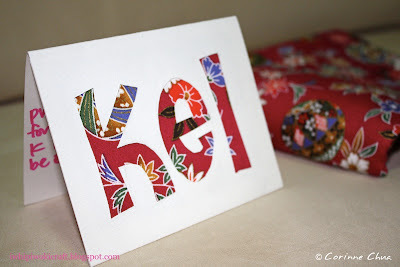 =) The choice of the fabric used was chosen with the recipient in mind and I hope Kel likes it! On a separate note, I attended a friend's wedding dinner last night and received this interesting and useful wedding favour that I really like! 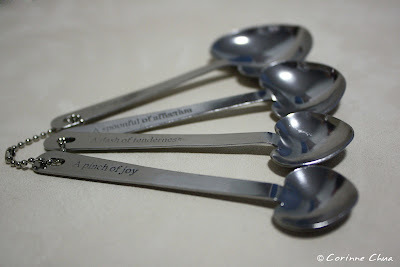 It's a set of measuring spoons with messages such as "a pinch of joy", "a dash of tenderness", "a spoonful of affection" and "a heap of love" on it. Before I go, I would like to wish all mothers and mother-to-be a Happy Mothers' Day! That's one cool wedding favour! Beats all the rest I've seen!